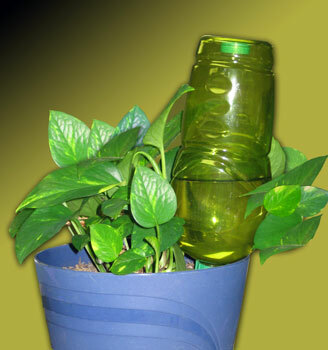 The idea for Plantastic®, (the automatic houseplant watering device that REALLY WORKS! ), took shape in the mid 90's as my parents, Chuck and Liz, prepared for retirement in Savannah, GA. They wanted to be able to visit their far-flung children and grandchildren but Liz had a tremendous collection of houseplants that needed to be watered. When returning from several weeks of travel she often found her plants to be dead or highly-distressed. She tried everything--putting them all (all 37 of them!) in 3 bathtubs, drip systems, pump and valve systems, reservoir systems, wick systems, gravity flow systems--you name it, she tried it. We bought and tested dozens of products that claimed to solve this problem of automatically watering unattended houseplants while you're on vacation-- but none did. Enter Chuck, who never met a problem he couldn't solve. As an engineer he led a rocket engine design team for the Apollo moon-landing program. So, although this isn't exactly rocket science, the rocket scientist set out to find a way to travel without having to rush home to water the plants. Between golf games he developed the first prototypes for a houseplant waterer. He began testing in Spring of 1996, and applied for a patent in October. On April 27, 1999 the US Patent Office issued a patent, and later a trademark, for Plantastic!® Several other patents are pending. Today, after over 5000 tests, there are over 1,000,000 Plantastic!®s installed for happy houseplant owners in every state of the US and numerous foreign countries. Now you too can enjoy worry-free vacations and travel knowing that your plants and houseplants will be watered while you're away. If for any reason you are dissatisfied with Plantastic!® within 30 days, you can be return it for a full refund. Please send it to Plantastic!®, PO Box 1717, Merrimack, NH, 03054. Please include in your package a brief description of the reason for the return and a phone number where you can be reached, as we always encourage feedback from our users. We will issue a refund, upon receipt of your information and verification of your claim, for any new and unused product. The product must be in resalable condition and must be returned with the original packaging. You may also write to us via this website by using the Contact Us page or phoning us at 678-590-1189. This site is provided by Plantastic!® Inc. on an "as is" basis. While we make every effort to be accurate with all the information presented on our site, the material in this site could include technical inaccuracies or other errors. Your use and browsing of this Website is at your own risk. Plantastic!® Inc. makes no representations or warranties of any kind, express or implied, regarding the operation of this site. Plantastic!® Inc. will not be liable for any damages of any kind arising from the use of this site, including but not limited to direct, indirect, incidental, punitive and consequential damages. Plantastic!® Inc. may include links to other sites but are not responsible for the contents of any off-site pages or other sites linked to this website. The inclusion of any link to such sites does not imply endorsement by Plantastic!® Inc. of the sites. Linking to any off-site pages or other sites is at your own risk. Plantastic! is not owned or operated by Easy Gardener, Inc, and is not affiliated with Easy Gardener. Plantastic! (JobesPlantastic.com) is the inventor and licensor of the patented technology to Easy Gardener who manufacturers and distributes the Jobe's Smart Watering System (originially known as Plantastic!). Jobes and Jobes Smart Watering System are Registered trademarks of Easy Gardener, Waco, TX. Plantastic!® Inc. is not responsible for any damages of any kind arising from the use of those sites, including but not limited to direct, indirect, incidental, punitive and consequential damages. This site is created, controlled and maintained by Plantastic!® Inc. in the State of New Hampshire, USA. The laws of the State of New Hampshire will govern these disclaimers. Plantastic!® Inc. reserves the right to make changes to this site and any terms, disclaimers or conditions at any time.